There are rare times in the world of the theatre that all the elements just seem to come together perfectly. 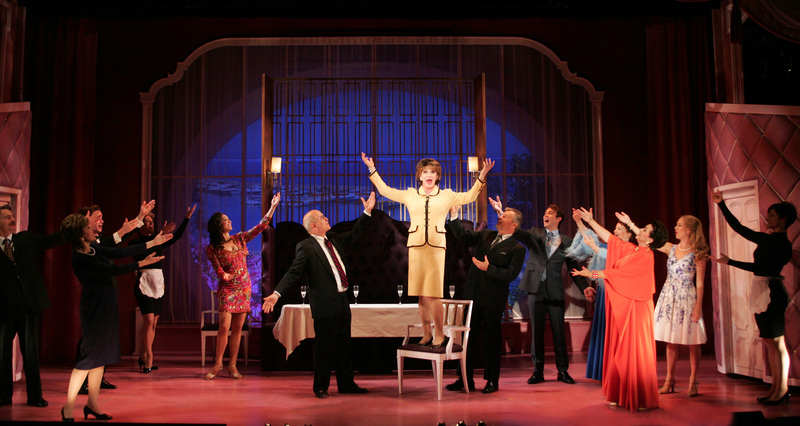 The current Goodspeed Opera House production of La Cage Aux Folles is one of those times, and I think I have discovered that perhaps you really can, “…go home again.” Tucked away and off the beaten path in the little town of East Hadddam, Connecticut, it was in 2012 that I first had the pleasure of discovering this great theatre. Actress, Sheila Smith, and the great Broadway orchestrator, conductor (and one of my fellow members of The Lambs Club), Don Pippin, were collaborating there on a special Goodspeed event in connection with its production of MAME. [See earlier review at: https://thepeoplescritic.com/2012/06/15/i-have-a-little-secret-id-like-to-impart/ ] That was a wonderful first experience of Goodspeed for me, and this La Cage was a wonderful welcome home. 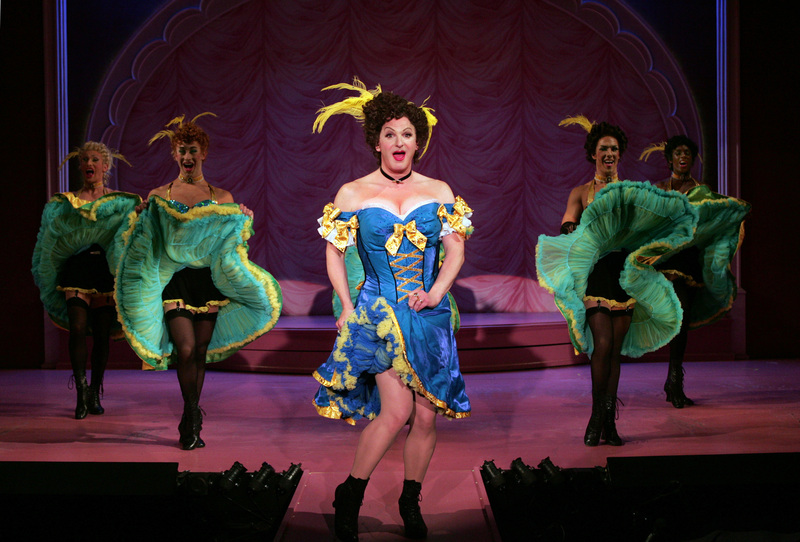 Based on the play by Jean Poiret, this musical edition features the very witty book of Harvey Fierstein and the delightful music & lyrics of Jerry Herman, — clearly a winning combination. Winner of six 1984 Tony Awards (including Best Musical, Best Original Score and Best Book), the production works beautifully on many levels, but Director, Rob Ruggiero, and Musical Director, Michael O’Flaherty, never lose sight of the two primary elements that comprise a musical comedy. 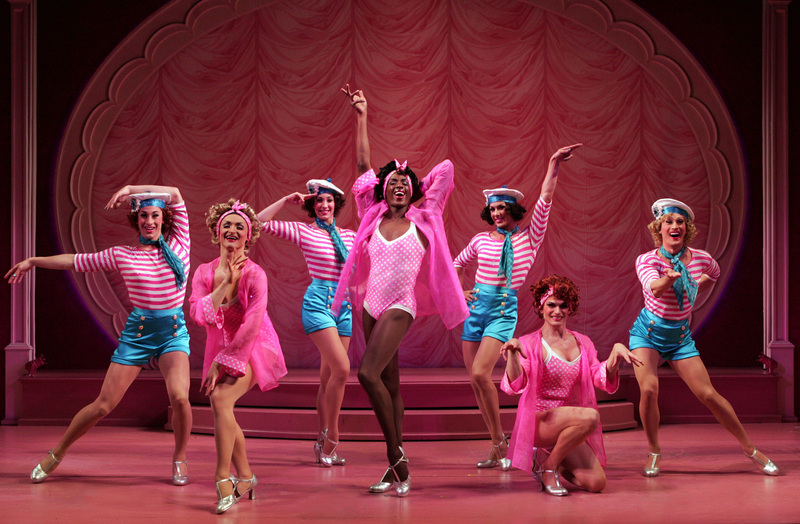 And I might add, that as lush and lovely as this musical score becomes in the hands of the show’s talented vocalists and musicians, the comedy is king here with the uproarious performances from this cast. 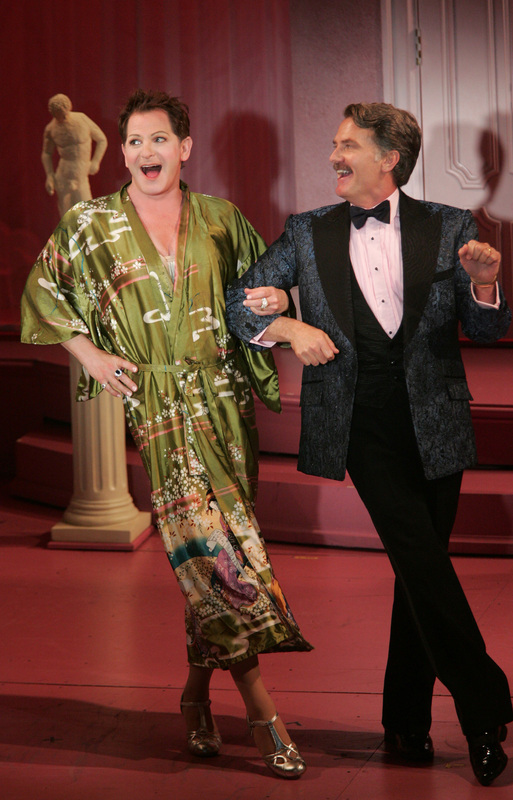 In this special circumstance, perhaps I could even risk saying the comedy is queen, because the nutty plot surrounds a gay couple that runs a very gay “drag” nightclub in Saint-Tropez called La Cage Aux Folles (with the French slang roughly translating as a “cage for very effeminate gays”). With a seemingly endless supply of handsome tuxedoes, and looking as dashing as Douglas Fairbanks, Georges (James Lloyd Reynolds) is the elegant and impeccable emcee and manager of the club. 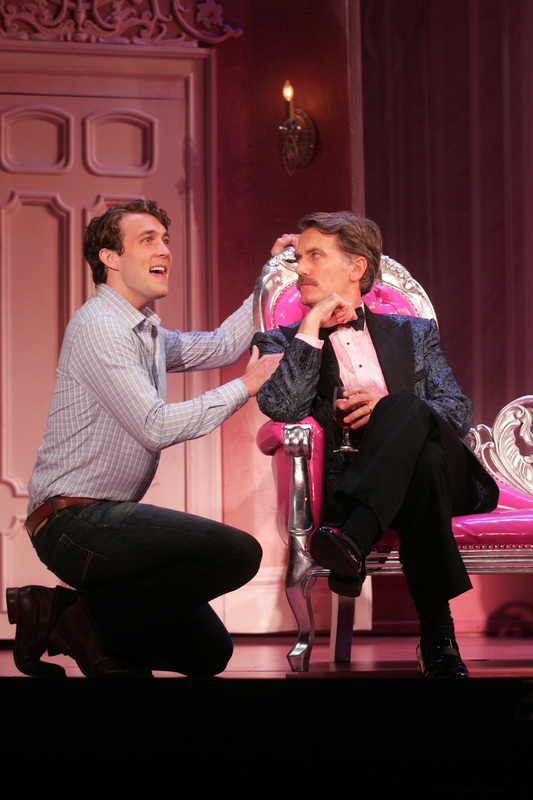 His very flamboyant lover, Albin, is portrayed here by the multi-talented Jamison Stern. While there are a few touching moments when this fine actor could break your heart, the essence of his zany performance is the epitome of comic mastery. 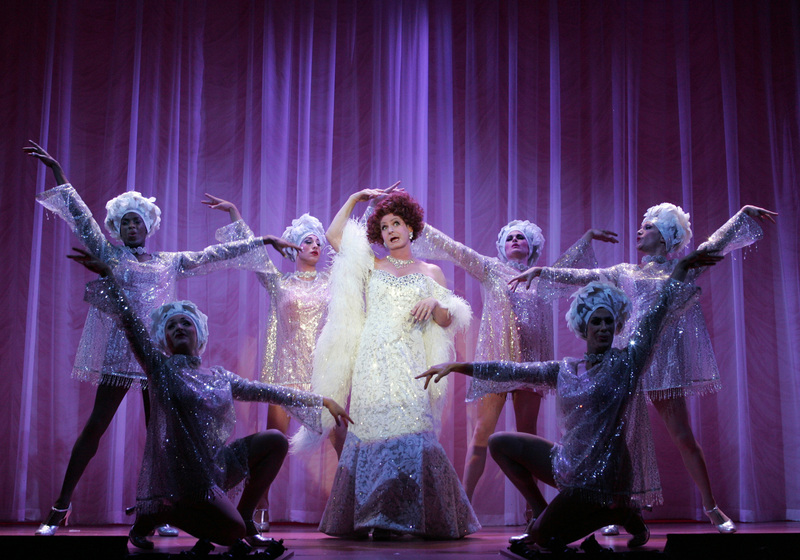 He has the audience howling with laughter throughout the show as Albin portrays the even more flamboyant character of Zaza in the nightclub act. But he is not alone, especially when it comes to the hilarious character of Jacob (Cedric Leiba Jr.), Albin’s ultra-gay assistant and butler, (who much prefers to be referred to as his maid). Leiba is a comedy genius in this deliciously comic role, and plays it to the hilt. Georges and Albin live in a garish apartment above the nightclub with no shortage of bawdy statuary and gay pink accents, right down to the eye-catching and silver-trimmed divan that highlights the room. They have been lovers for years, though a one-night stand years before resulted in Georges becoming the father of his now grown son, Jean-Michel (Conor Ryan). Georges and Albin have affectionately raised the boy as their own, with Albin very much playing the maternal role. Things begin to get complicated when Jean-Michel arrives for a visit bearing the news that he is planning to marry Anne Dindon (the beautiful Kristen Martin). He wants to bring the parents of the bride-to-be, M. & Mme. Dindon, (droll performances from Mark Zimmerman & Stacey Scotte) to meet his own parents. But alas, Jean-Michel’s mother, Sybil, has been estranged for years, and Georges has no desire to reconnect with her. Worse still, it turns out that Anne’s father is the leader of the French TFM Party (Tradition, Family & Morality) which has at its core an intolerance of homosexuals. In addition to asking that Sybil be invited, Jean-Michel wants the apartment redone in more traditional style, and worst of all, does not want the very effeminate Albin to be present at all during the visit of Anne and her parents. The glue that blends all these confusions into this delicious piece of theatre is the aforementioned music and comedy. Right out of the starting gate we have the joyful nightclub number, “We Are What We Are,” performed by the club’s glamorous drag queens, Les Cagelles, and they shortly evolve into a dazzling troupe of tap-dancing sailors that could have easily formed a grand finale rather than an opening number (Choreographer, Ralph Perkins). 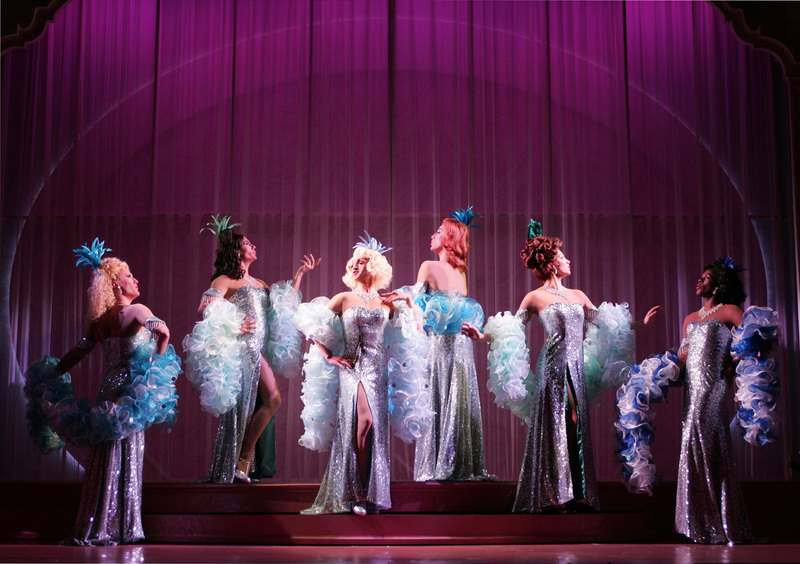 Colorful feather boas and glittering costumes abound in various show-stopping numbers (Costume Designer, Michael McDonald), while the attractive scenic designs of Michael Schweikardt nicely frame the action. Meanwhile, the beaming and very handsome Mr. Conor brightens the production with winning charm and personality as he brings his richly resonant voice to the melodically wonderful, “With Anne on My Arm.” That tune is sweetly reprised when Georges and Albin duet for, “With You on My Arm,” and the poignant “Song of the Sand” that follows is a touching reflection of lost youth that is tenderly performed by Mr. Reynolds. Toward the end of Act One, Albin and the Cagelles offer a knockout number that even features the gymnastics of a very athletic Can-Can. 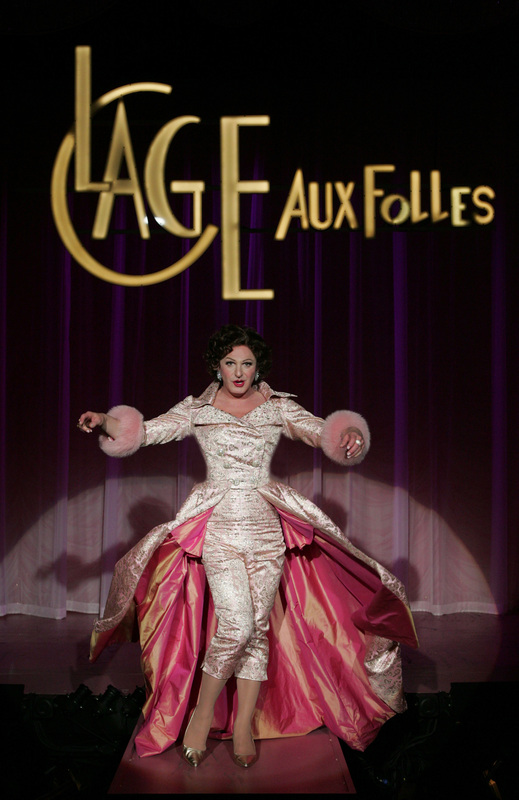 LA CAGE AUX FOLLES continues through September 10th at the Goodspeed Opera House in East Haddam, Conn. Please visit www.goodspeed.org for details and availability. This entry was posted in Broadway, BroadwayStars.com, Don Pippin, Goodspeed Opera House, Harvey Fierstein, Jerry Herman, La Cage Aux Folles, Sheila Smith, ThePeoplesCritic.com and tagged Broadway, Don Pippin, Goodspeed Opera House, Harvey Fierstein, Jerry Herman, La Cage Aux Folles, musicals, Sheila Smith. Bookmark the permalink.